This might be one of those rare books that the movie is better than. Or that I understood the movie better. Although the book helped me figure a few things out in the movie. But I did like the book, because I already knew the characters. Hmm. They just really go together! I am not usually a fan of the tragic love story, like Romeo and Juliet. I am much more pragmatic. However, The English Patient (the movie) worked for me. I bought the love story, tragic ending and all. Ralph Fiennes helped a lot! With that background, I quite enjoyed the book. The major difference I noticed was that the movie was about the English Patient and Catherine, his love. The book is more about the nurse and the bomb-defusing Indian soldier, the awesome dude from Lost. Another reason I liked the book was because I really liked those characters and their love story as much as the English Patient's. After reading the book, I am even more impressed with the movie and how it was put together. This is one of those modern classic novels I've been wanting to read and I would try another Ondaatje novel. He wrote amazingly intricate characters, about the after effects of war on all kinds of people from war, all in spare yet easy to read prose. Ondaatje gathered this Commonwealth of characters with connections and challenges that are so damaged, physically and emotionally. This Top Ten List worked so well for me in the spring, that I'm going to make a summer list as well. I'll try to go with the same mix of new releases, older books, mysteries, and in honour of Canada Day on July 1st, Canadian books. My spring list was a great motivator. I read seven of the nine I listed by name. One of the ones I didn't read, The Age of Doubt didn't arrive until the end of May, and the other one, 1222 by Anne Holt, is still on request at the library. I moved from 11th to 6th spot since March! I don't think I'll add it to the summer list as it looks unlikely that I'll get it before the summer is over. The last title I listed was just Orange Longlisted books, and I managed to read 5 of them (The Sealed Letter, The Island of Wings, Gillespie and I, The Forgotten Waltz, and The Song of Achilles). What books are you looking forward to reading this summer? Head on over to The Broke and the Bookish to link up and to see what everyone else is saying! I received this one from Randomhouse. Love dystopian novels - the world has begun to slow down in its rotation. Can't wait to read this one! Giller Winning Canadian novel that is the next book for my book club. A book about the north of Canada should be just the thing on a hot summer day. This will be my Scandi-crime novel in place of 1222.I have it from the library right now. My first steampunk novel! This young adult book will be released in the summer, and it looks like a fun book. 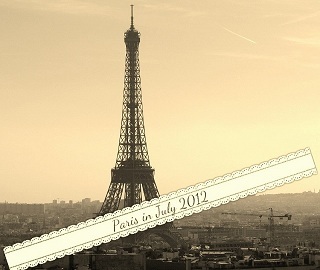 I have to have something for Paris in July on my list. Carrie (nomadreader) sent me this book last year after Paris in July and I've been holding on to it for this summer. A big ole Stephen King is perfect for summer reading. I can stay up late, get scared, read and snooze on a lawn chair the next day. How perfect does that sound? Great mysteries with characters I've read before: Mat Joubert and Lemmer. Meyer does great, complicated mysteries with well developed characters, all set in South Africa. He's becoming my new favorite mystery author. This is going to be my 'new summer book' buy, as I seldom buy newly released books. 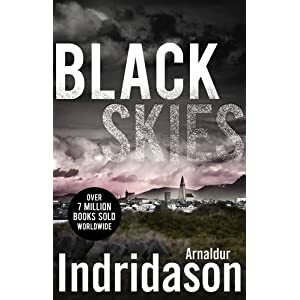 It is released the beginning of July, and will be the fourth book in the Dublin Murder Squad series. I think I get this one mixed up with another book, The Boy in the Suitcase? I've had this one for a while, so let's get it on the summer reading list. When She Woke is Hillary Jordan's fantastic retelling of The Scarlet Letter by Nathanial Hawthorne, but a futuristic version. Instead of Hester Prynne being forced to wear the red letter A on her clothes, for adultery, after having a baby with minister Arthur Dimmesdale in Puritan America, we have Hannah Payne who is 'chromed' red after having an abortion with evangelical minister Aiden Dale in a future America. Both women refuse to name the father of their child, and in both cases, only the woman is punished. Sidetrack: I read The Scarlet Letter when it was about to be remade into a movie starring Demi Moore in 1995. I accidentally picked up The Scarlet Pimpernell which turned out to be a far superior book in my view. When I finally read The Scarlet Letter, I was terribly bored. It was the style of writing, late 19th century American writing more than the story which bothered me. The plot and characters were fine, but I cannot stand that prose. I was put off enough by the book that I never did see the movie, but I am glad that I read the book, if only to have the literary references to read When She Woke. Ah, classic novels. We have to read you if only to better appreciate the homages that are written. I loved Bridget Jones' Diary, but after reading Pride and Prejudice, I appreciated it even more. Back to When She Woke, which is really the beautiful child of The Scarlet Letter and The Handmaid's Tale. I could predict the arc of the story: Young naive girl has never questioned the world she lives in. Suddenly thrust into reality of her world, she meets brave people who rebel against all she has believed, and gradually, through some dangerous situations, faces the truth of the society that has kept her down, and recognizes the wrong in her past beliefs. As predictable as all dystopian novels, Jordan does an excellent job of following the standard steps, and making characters that are believable, and still adding some plot twists to keep the reader entertained. As I carried this book around in the past week, I pushed and or recommended this book to all my reading friends. There is a religious aspect to the novel, as Hannah is forced to examine her beliefs, and her God. Jordan exposes Hannah to several extremes, and while the author's view comes through (I think) she does present different sides, (kind of like Stephen Colbert does!) This book was only released in October 2011, so it is still a fairly new release. I saw it was picked as a possible Orange nominee on a couple of predicting lists, which is what piqued my interest. Fans of Jordan's first novel, Mudbound, will be especially impressed with the author's versatility and talent. 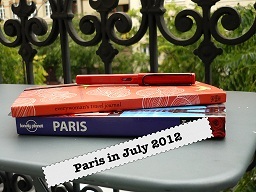 I had a lot of fun last year reading for Paris in July, so I am pleased that Karen at Bookbath and Tamara at Thyme for Tea are again hosting a Paris in July event. During the month of July, read your book, eat some food, watch a movie. Something French. It's as good as all the rave reviews say, it's as sad as you would imagine, and it's still a good book. I do enjoy a book that makes me cry, and I started well before the last hundred pages. There are a few leaps of faith the reader has to make in the plot, which has some coincidences at the end, but by then you are so invested, and emotionally involved, you let them slide a bit. Because by then, you can't stop reading (oh, dear, how is it going to end?) so you keep reading. It's a really great book that is as much about living as dying. Wow! I really was one of the last people to read this book. I actually pre-ordered it from Chapters, and received a signed copy. However, I thought I'd be smart, and preorder another book not released until May. My evil plan was that even though I picked free shipping, and they tell you that it will be shipped in one package (hence, May) my experience has been that they send a book once it was available, and you wait for the later book. But Chapters decided not to reward my attempted sneakiness, and didn't send either book until The Age of Doubt was released in May. So I preordered The Fault in Our Stars, and then didn't get it till May. But I didn't pay shipping. This meme (highlighting crime fiction titles or authors) was run first on Mysteries in Paradise in 2009-2010 and was re-run in 2011. This week's letter is the letter C. Head over here to see what other books are being highlighted this week.This week I"m highlighting author C J Sansom and his mystery series. Tudors! Murder! What's not to like? First in the series with the hunchback lawyer, Matthew Shardlake, associate of Thomas Cromwell. Shardlake is sent in to a monestary to discover who killed the representative who was sent in to possibly disband the monks. Lots of motive, lots of great characters. And then another murder, or two. Shardlake is an idealist about religous reform, and I fear in later books he may be disillusioned by Cromwell's ambition and questionable methods. This was hinted at in this book. He's a great main character because his physical ailments make him an outsider, not the usual person in power, but his skills as a lawyer and his intelligence overcome his hunchback. This series is like a more modern Brother Cadfael mystery - no matter the time, there will be people behaving badly. Looking forward to more of Matthew Shardlake. Books I'm looking forward to. I have no idea if they are being promoted at BEA, but they are the books by favorite authors that I am very much looking forward to. I'm a forty-something female; married, with 3 kids; high school teacher; living on beautiful PEI. I've been blogging a little over 5 years, but I seldom remember to note the anniversary. I came for the place to talk about books, stayed for the people that I've met. I'm reading The Known World by Edward P Jones (for the first meeting of the first real book club I've ever joined) and The Age of Doubt by Andrea Camilleri, one of my favorite mystery series. Favorite reads so far in 2012: Half-Blood Blues, The Girl Who Played With Fire, and The Fault in Our Stars, plus a few more. I've had a good year reading so far. 3. What is was your favorite feature on your blog (i.e. author interviews, memes, something specific to your blog)? I haven't been as creative as I once was on my blog. I really enjoyed doing It's Tuesday, Where Are You?, giving people a chance to tell what book they were reading by the settings. Like a lot of blogging, it took time and planning, and it seemed to be dropping off in participation. 4. If you could eat dinner with any author or character, who would it be and why? And What literary location would you most like to visit? Why? Watch me find a way to combine two questions in one: I would like to travel with Bridget Jones to Sicily, home of Inspector Montalbano (of The Age of Doubt), to sit on the beach and have a few drinks.Yes, drinks with Bridget on the beach of Sicily sounds very nice. 5. What is your favorite part about the book blogging community? Is there anything that you would like to see change in the coming years? Just all the wonderful people I've met from around the world who share a love of reading, and of keeping lists of their reading. Now when I think of planning trips, I think about who I might meet if I travelled there. Now I'm off to check out the Armchair BEA host site and see what else is happening this week. People shouldn't be having fun without me! I knew a lot about Isaac Newton, but had never read it all in one place. I teach high school physics, so I thought I should read about him, so that I can feel more confident about any anecdotes I tell. Most of what I read was familiar, but I can speak better about his time at home from university during the plague (I may have thought he was in an institution, so there's one correction), his feud with Robert Hooke (a lot of it comes down to communicating through letters, kind of like email) and Leibniz, the German mathematician. Newton and Leibniz independently developed calculus, and then fought over the notation and who did what first. Egos! It's a scientific biography, containing pages and pages of notes and references, but I still found it readable. Not engrossing, but readable. I referred to the notes at the back as I read, as some of them provided additional background to the story. I've got a better picture of Newton, the man and the scientist, and still am completely amazed at his insights and theories, many of which were not confirmed or built on for years. He had theories about everything! Gravity, light, forces, the idea of mass, just even how Newton defined terms that were in use, to get scientists speaking the same way. 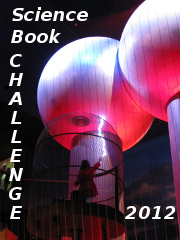 Every year I attempt this challenge, as I do like to read nonfiction science books. Count Newton as book number one.